Knock Balls is an awesome arcade game from VOODOO. Throw balls at structures to make them collapse but be careful not to exceed the allowed limit. Each saved ball will count double at the next level, take advantage of it to apply you. 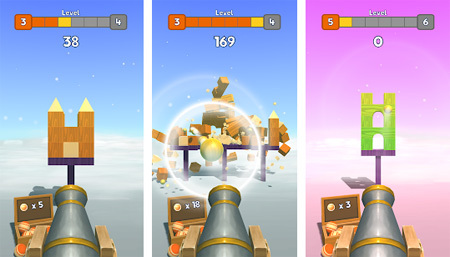 The game features one-tap easy-to-learn controls with stunning visual effects and addictive gameplay mechanics. If you get stuck in the game, check out the video walkthrough and gameplay for the game. This entry was posted in Android Games, iOS Games, Mobile Games, Walkthrough and tagged Knock Balls Cheats, Knock Balls Game, Knock Balls Gameplay, Knock Balls Guide, Knock Balls Hints, Knock Balls Review, Knock Balls Solutions, Knock Balls Strategy, Knock Balls Tips, Knock Balls Walkthrough by Marvin. Bookmark the permalink.